4 bedrms, 2 bathrms (1 ensuite), sleeps up to 8. Lakeside beach 15 mins. Recently renovated, the comfortable cottage, set 1 km outside of the village, offers flexible accommodation, on 2 floors, which is ideal for 2 families. Downstairs, there are 2 bedrooms, 1 double, 1 twin and a bathroom. Upstairs, there is 1 large double bedroom and an adjoining smaller bedroom which can sleep 2 (twin). This area has a fabulous walk in wet room shower and WC (en suite). Outside, is the pool and plenty of loungers.for relaxing in the sun. Pool is also partially shaded. There is a large garden area where you can relax in the sun, eat at the table and chairs, use the BBQ. There is plenty of room to spread out and relax. There is also a little 'secret garden' which has a canopy of trees and you can relax in the hammock . This area also has an area for clothes drying. At the rear, there is a huge 2 acre field and the children can play here in absolute safety. This lovely house enables you to enjoy the beauty of French country living with the total comfort of modern living. Children are especially welcome and young children and babies are well catered for. We have 2 cots (1 wooden, 1 travel type) and 1 high chair but can easily arrange a second. There is a potty and a changing mat and we have a safety gate which can easily be set up. The gates to the front close and the young ones can play in safety, although always with the parents on hand! Travelling: Although Bordeaux is the largest International airport, this area is very well served by other smaller airports especially used by the budget airlines. Ryanair is most prolific. Poitiers - one and a half hours. All of these airports have car hire facilities, so driving here may not be your only alternative. Outdoor facilities. : The splash pool is recently installed and great for the kids to play and adults to cool down. It is set in a private enclosed garden (see photo) and has sun loungers to relax. As it is set in partial shade, it can let the children play with greater safety. It is exlcusively for your use. No sharing. We have tried to think of keeping the children occupied and have a great assortment of outdoor games and toys. There is also a selection of cycles which guests are more than welcome to borrow. There is boules,swing ball, a weird Swedish game left by some visitors like skittles,badminton, a small pool table,large table tennis, to name but a few. Jeff and I moved here at the beginning of 2004 from the UK. We decided to do something we have always dreamed of and that is to live in France. We both left demanding jobs and set about renovating the house and gite. Great fun and a huge amount of work! But we got there and now have a lovely home and a popular gite. We are in the country and so look forward to our guests arriving and meeting them all. We chose this property as it was something we never thought we could possibly have owned in the UK. It sits in just under 2 acres and has views to die for. Chateauneuf sur Charente is really what persuaded us this was the right area for us. Pretty French town and the river runs through it. It was originally the home of the local vineyard owner and even today his son tends the vines which surround the property. The house has amazing views and the scenery especially from the upper floors, really persuaded us. When we first saw the house, the original features were well hidden but we could see the potential. 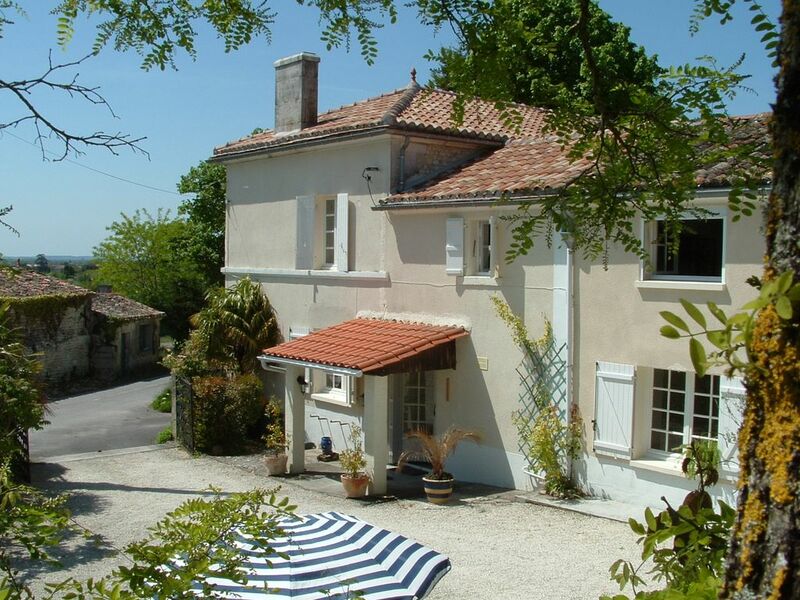 We renovated to keep it very much a beautiful French house but with good plumbing! Both of the bathrooms are new and very well appointed. With attractive tiled floors and walls, it offers luxury and practicality. There are mirrors and towel rails. Having both bathrooms in the property makes this perfect for two families as it offers excellent privacy and convenience. Bathroom towels and some beach towels are provided. The wood stove is for winter renters and is not available between June and September. Seats 8 easily. UK TV and a table for laptop if required. A full range of cycles for most ages/sizes. Free of charge. The cottage was lovely and cool (temperatures 30-35c outside). The pool was wonderful and the games facilities very good. The area is very peaceful and the shop in Jurignac was great. The cottage is surrounded by sunflowers, cornfields and vines - very, very rural. Liz and Jeff were very hospitable and nothing was too much bother. All in all we had a wonderful time and would thoroughly recommend it. Had a great time at Chez Briand, Liz and Jeff both very welcoming delightful people with a beautiful Gite. Had a great week travelling around the area from this wonderful base. A Fantastic holiday for all of us. The owners were lovely and very helpful without being obtrusive. The accommodation was just as described? It was clean and well maintained throughout. The furnishings were comfortable and very homely and the catering facilities and equipment available were more than adequate for all the family. Outside, the raised pool was an absolute godsend not only because of the very hot spell we had but also because we could relax in the knowledge that the 2 year old could not gain direct access! There was every conceivable outside game available too, plus a first class BBQ, outside furniture and gazebo. The area is rural but there were very adequate shopping facilities 5 miles away also interesting places to visit, however, the cottage was so comfortable we did stay "at home" more than we had originally intended. We would certainly recommend this property and look forward to returning. Thank you so much for your lovely review. We work hard to maintain and raise the standards of our gite and hearing your comments makes all the work worthwhile. You were most welcome at our house, the perfect guests. We had a wonderfull time at the house of Jeff and Liz! We arrived a little bit earlier, but we had to drive so far with 4 little children, but Jeff and Liz arranged everything to welcome us immidiatly. It's a nice house, clean, with everything you need for a nice vacation. We recommand it for a stay with children, because there's a lot of toys for them, bikes, a little swimmingpool and so much more. We really had a nice time with our friends and kids. Thank you very much! We were delighted to welcome our Belgian guests and were happy to prepare for them and their beautiful babies after such a long journey. How lovely our efforts were appreciated! Thank you . Wish I was there (again)! We have just come home after a lovely week staying at this comfortable, friendly cottage and we wish were still there. Liz and Jeff are great hosts, the house was lovely and clean and welcoming. We arrived quite late but Liz had thoughtfully got us some food and essentials to cover us over the first night. The House is comfortable and has everything you need, there were plenty of towels, the kitchen was well equipped, the beds are comfy and the sitting room is relaxing too. The weather was really hot but the house stayed nice and cool inside. The new pool was very useful in the hot weather, there are different areas to sit outside to be in the shade or sun. The location of the house is excellent, being in the countryside but it's not too far to travel to get to the main roads and shops. There are quite a few airports all with in a reasonable distance and the railway station is at Angouleme. The countryside around the house is made up of vin yards and huge fields of Sun flowers - just how you imagine France to be! We recommend visiting Chateauneuf which is quite close, Bordeaux is only an hour away, Cognac is also near, plus plenty more. We went to Oradour Sur Glane too which is very thought provoking! All in all we had a great time and recommend the cottage for a group of adults or families with children of all ages. We hope to be back soon! When we receive lovely clients like yourselves, it is a pleasure for us too. Thank you so much for leaving the cottage to clean. It really helped with the next clients who arrived super early! We wish you a speedy return! Liz and Jeff offer a lovely holiday property - from first impressions it looks a warm and welcoming place to stay - and so it was. The description and photos of the property are completely accurate - it is as nice as it looks! Informality is the key here, nothing is too much trouble for Liz and Jeff. Lots of books to read, lots of info on places to visit and a lovely relaxing atmosphere combine to make a super holiday. Jeff has lots of interesting facts about the local area and can recommend places to visit etc. We thoroughly enjoyed the stay - we took a couple of trips on the bicycles provided to explore the local countryside and found it to be a totally relaxing area with very friendly local people. If you are planning a holiday to this area, then we would highly recommend that you stay at Liz and Jeff's place! Jurignac is a quiet little village, surrounded by vineyards, which has a small grocers/boulangerie/cage/bar , a post office and it's very own Cognac house, where you can sample and buy the village's own label cognac.. Easy to get to, the nearest on/off for the RN 10 is about 3 miles, this access allows you to travel to other parts of the area and see many of the other beautiful villages and towns close by. Angouleme, a large town with a wonderful 'old town' full of busy restaurants and shopping , is just 20 minutes drive away. It also boasts a fabulous water park, Nautilus, which has both indoor and outdoor pools. The smaller towns of Chateauneuf and Barbezieux, again both with open air swimming pools for daytime fun and a good selection of restaurants and bars for the evening. The summer temperatures are usually very warm, and the River Charente is close by (less than 10 minutes) and there you can swim if you wish or enjoy a drink at the riverside bars and restaurants. Other Activities: There is a very large garden at the rear of the property and is ideal for children to play. Ideal for cricket and football. Golf: There are 3 golf courses within 35 minutes. One in Cognac, one in Angouleme and the other in Aubeterre. Each club welcomes day visitors.